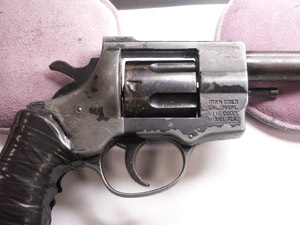 The most common request made of the Firearms and Toolmark Section is to compare fired bullets and cartridge cases collected from a crime scene or autopsy to a gun recovered in the investigation, however there are many additional types of examinations and comparisons that may be done to assist in your investigation. Below you will find a brief description of services offered by the Firearms and Toolmark Section. When fired bullets, cartridge cases, or shot shells are collected with no firearm to compare to they can be compared to one another to determine if they were fired from the same firearm and determine how many firearms were involved in the crime. 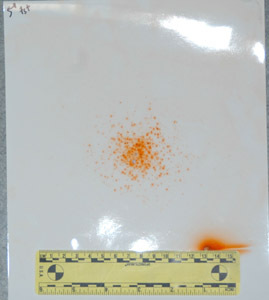 In cases where a weapon is not available for comparison to a fired evidence bullet, the laboratory can provide a list of weapons that may have fired the bullet. By measuring the class (caliber, weight, shape and construction of the bullet) and rifling characteristics (direction of twist, number of land and grooves and widths of land and grooves) of the fired bullet and checking these against the Federal Bureau of Investigation’s (FBI) General Rifling Characteristics (GRC) Database, a list of weapons that may have fired the bullet can be provided. Marks impressed on a cartridge case may also provide some information as to the type of firearm it was fired in. Firearms may be examined to determine their ability to function as designed. This type of examination may be important in cases such accidental shootings, suspicious suicides, etc. Fired evidence bullets, cartridge cases, and shot shells can be microscopically compared to test fired bullets, cartridge cases, or shot shells from a suspected firearm to determine if they were, or were not fired from that particular gun. By examining gunshot residue patterns around a bullet hole in a garment or other object of evidence, and comparing this pattern to test patterns produced using the firearm and ammunition in question, a distance from muzzle to target when the gun was fired can be given (usually given as a range of distance). This type of analysis generally requires the questioned firearm and ammunition for testing. 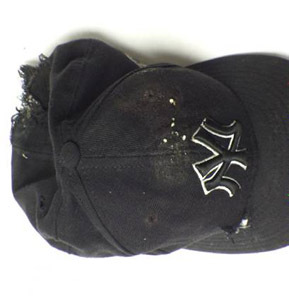 Other information such as autopsy reports, crime scene photographs showing any bullet holes or wounds and any witness statements can be helpful in determining the muzzle to target distance. Fired evidence bullets and cartridge cases can be examined to determine a possible manufacturer or compared to unfired cartridges to determine consistency in construction/manufacturer. 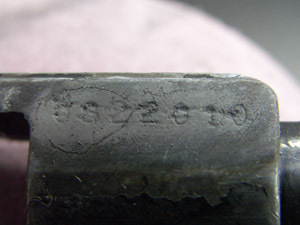 Headstamp characters on fired or unfired cartridge cases can be compared to make identification to the tool used to stamp the characters. This may show an association between items when a traditional comparison is not possible. 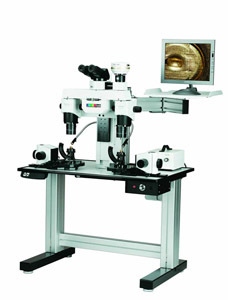 IBIS is a digital imaging system used to capture images of fired cartridge cases from crime scenes and from firearms seized in conjunction with criminal investigations. 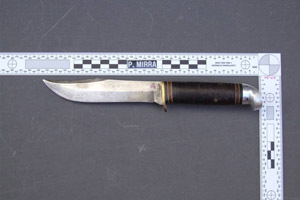 The NIBIN database compares these images against other images from fired cartridge cases to identify investigative links between firearms and crime scenes. The Forensic Science Division will accept all non-revolver pistols (all calibers), rifles (all calibers) and shotguns for entry into NIBIN. Please note that not all fired or test fired cartridge cases will have sufficient marks for database entry. 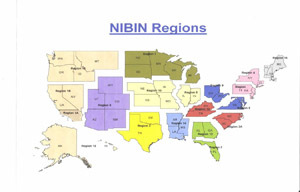 If this occurs, your agency will be notified via an official report stating there were insufficient marks for entry into NIBIN. The Forensic Science Division, as a routine practice, will not enter test fired cartridge cases from revolvers. Should there be a special request to enter revolver cartridge cases, please contact the Firearms Supervisor directly. 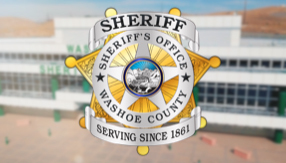 The IBIS system at WCSO-FSD does not have the capability to image bullets. Images of fired and test fired cartridge cases are routinely searched against the local database that encompasses northern Nevada and all states located in Region 1B (see below). The Firearms Section can search images nationally; however, a special request must be made for this search to be conducted and if your request is granted your agency will receive an official report stating the region(s) searched. Virtually any object made of metal, which has had a stamped serial number removed or defaced, has the possibility of being restored. Serial numbers, which have been stamped into a variety of items, in addition to firearms, can all potentially be restored. During the process of number stamping, the metal underlying the number is placed under greater stress than the surrounding metal. 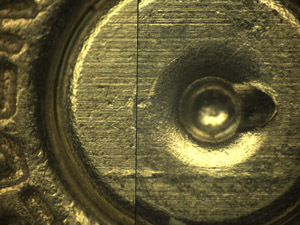 Even though a person may file or grind away at this number until it is no longer visible, portions of the stressed metal from the stamping will remain. In the laboratory the defaced surface, where the serial number was, is treated with one or several chemical etching solutions. These chemical-etching solutions will cause the stressed and unstressed metals to behave differently. 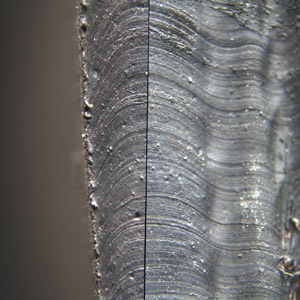 The different behavior is a chemical reaction visible at the sites of the stressed metal. A complete restoration is not always obtained. In some cases, the eradication process may have been sufficient to completely remove the stressed metal in some areas. This usually results in a partial restoration being obtained. Loaded firearms should not be submitted to the Forensic Science Division. All ammunition magazines and cartridges should be removed and packaged separately for submission (they can be submitted in the same package with the firearm). If assistance is needed with making firearms safe, consult the Firearms Section of the laboratory or a range master. A firearm should not be disabled by disassembling any part or mechanism. Do not mail loaded weapons! Semi-automatic firearms – magazine (in or out), round (chambered or not), hammer position (if external), slide position (forward or back) and location of any jammed cartridge/fired cartridge case. Multi-barreled firearm – chambers (empty or loaded), hammer(s) position, breech (open or closed). Package firearms to prevent altering the evidence in any way, to prevent cross contamination and to preserve potential fingerprints or DNA evidence. When removing a bullet from drywall, wood or other material, cut around the bullet and submit – avoid using metal devices that may mark the bullet. Bullets and cartridge cases should be dried prior to packaging as moisture will corrode the metal and may destroy markings of value. Bullets (especially lead) should be packaged to protect them from being marked in transport. Cartridge cases and bullets should be packaged in an envelope or box. Heat-sealed plastic bags and zip lock bags are acceptable for packaging as long as there is no moisture. Evidence for distance determination examination should be packaged carefully with paper laid between layers to keep gun powder particles in place and to prevent transfer. Items that have blood or other biological fluid must be air dried prior to packaging and labeled appropriately with a BIOHAZARD label. Trajectory measurement and reconstruction of the bullet's flight path prior to impact. Assistance with firearms, including unloading and making them safe to package and submit to evidence. Other general assistance at the direction of a Forensic Investigator. Tool mark examination consists of comparing an object with a tool mark to a suspect tool or another tool mark. When two objects come into contact with one another, the possibility exists that the harder object will mark the softer object, leaving markings that can be microscopically compared. Examples of common tool mark/tools would include cut padlocks/bolt cutters, door lock striker plates/pry bar or screwdriver, knives/stab marks in tires, doorknobs/vise grips or pliers. It is important for investigators to keep an open mind when considering collecting tool mark evidence. Toolmark evidence can come in a variety of forms. Do not attempt to fit the tool and tool mark together at any time as it may compromise the integrity of the tool and/or tool mark; additionally trace materials could be transferred in the process. Do not change the position of a tool's working edges such as on a slip jawed pliers. Do not package a suspect tool and an object possessing a tool mark together, they must be in individual containers. If an object bearing a tool mark is too large to be easily collected it must be photographed first and then cast. A silicon rubber cast is taken and the cast is submitted for comparison instead of the object that contained the tool mark. 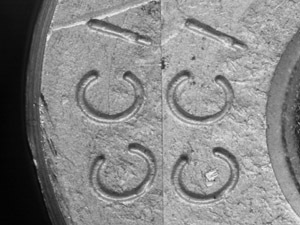 Detailed photographs, parallel to the tool mark with an “L” scale, should be taken prior to casting. 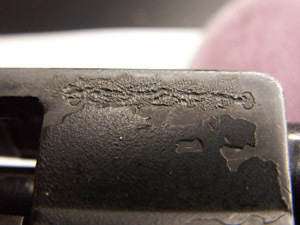 The cast should be photographed before and after removing it from the tool mark surface.